This article is about the English engineer. George Stephenson (June 9, 1781 – August 12, 1848) was an English civil engineer and mechanical engineer who built the first public railway line in the world to use steam locomotives and is known as the "Father of Railways." The Victorians considered him a great example of diligent application and thirst for improvement, with Scottish author, reformer and self-help advocate Samuel Smiles particularly praising his achievements. Stephenson's rail gauge (of 4 ft 8½ in, or 1435 mm), sometimes called the "Stephenson gauge," is the world's standard gauge for railroad tracks. In 2002, Stephenson made the BBC list of the top 100 greatest Britons. George Stephenson was born in Wylam, Northumberland, 9.3 miles (15.0 km) west of Newcastle upon Tyne. He was the second child of Robert and Mabel, neither of whom could read or write. Robert was the fireman for Wylam Colliery pumping engine, earning a low wage, so that there was no money for schooling. At 17, Stephenson became an engineman at Water Row Pit, Newburn. George realized the value of education and paid to study at night school to learn reading, writing and arithmetic. In 1801, he began work at Black Callerton colliery as a ‘brakesman’, controlling the winding gear of the pit. In 1802, he married Frances (Fanny) Henderson and moved to Willington Quay, east of Newcastle. There he worked as a brakesman while they lived in one room of a cottage. George made shoes and mended clocks to supplement his income. In 1803 their son Robert was born, and in 1804 they moved to West Moor, near Killingworth while George worked as a brakesman at Killingworth pit. His wife gave birth to a daughter, who died after a few weeks, and in 1806 Fanny died of consumption. George, then decided to find work in Scotland, and he left Robert with a local woman while he went to work in Montrose. After a few months he returned, probably because his father was blinded in a mining accident. George moved back into his cottage at West Moor and his unmarried sister Eleanor moved in to look after young Robert. In 1811 the pumping engine at High Pit, Killingworth was not working properly and Stephenson offered to fix it. He did so with such success that he was soon promoted to enginewright for the neighbouring collieries at Killingworth, responsible for maintaining and repairing all of the colliery engines. He soon became an expert in steam-driven machinery. Statue of George Stephenson at the National Railway Museum, York. In 1818, aware of the explosions often caused in mines by naked flames, Stephenson began to experiment with a safety lamp that would burn without causing an explosion. At the same time, Sir Humphry Davy, the eminent scientist was looking at the problem himself. Despite his lack of any scientific knowledge, Stephenson, by trial and error, devised a lamp in which the air entered via tiny holes. Stephenson demonstrated the lamp himself to two witnesses by taking it down Killingworth colliery and holding it directly in front of a fissure from which fire damp was issuing. This was a month before Davy presented his design to the Royal Society. The two designs differed in that, the Davy’s lamp was surrounded by a screen of gauze, whereas Stephenson’s lamp was contained in a glass cylinder. For his invention Davy was awarded £2,000, whilst Stephenson was accused of stealing the idea from Davy. A local committee of enquiry exonerated Stephenson, proved that he had been working separately and awarded him £1,000 but Davy and his supporters refused to accept this. They could not see how an uneducated man such as Stephenson could come up with the solution that he had. In 1833 a House of Commons committee found that Stephenson had equal claim to having invented the safety lamp. Davy went to his grave believing that Stephenson had stolen his idea. The Stephenson lamp was used exclusively in the North East, whereas the Davy lamp was used everywhere else. The experience with Davy gave Stephenson a life-long distrust of London-based, theoretical, scientific experts. Richard Trevithick is credited with building the first locomotive in 1804. Later, he visited Tyneside and built an engine there for a mine-owner. Several local men were inspired by this, and designed engines of their own. In 1813, hearing about the success of William Hedley and Timothy Hackworth with an early steam locomotive at Wylam Colliery, Stephenson persuaded Nicholas Wood, his own colliery manager, to let him try his hand at building a railway engine. Stephenson designed his first locomotive in 1814, a traveling engine designed for hauling coal on the Killingworth wagonway, and named Blücher after the Prussian general Gebhard Leberecht von Blücher. The Blucher was slow and unreliable on the colliery's wooden tram road, but its two vertical cylinders set into the boiler allowed it to haul 30 tons of coal up a hill at 4 mph (6.4 km/h). Avoiding the use of cog and rack pinions, the Blucher was the first successful flanged-wheel adhesion locomotive: its traction depended only on the contact between its flanged wheels and the rail. Stephenson improved the design by making the connecting rods drive the wheels directly, coupling each pair of wheels together by a chain. Altogether, Stephenson produced 16 locomotives at Killingworth. The new engines were too heavy to be run on wooden rails, and iron rails were in their infancy, with cast iron exhibiting excessive brittleness. Together with William Losh, who owned an ironworks in Newcastle, Stephenson improved the design of cast iron rails to reduce breakage. He also managed to solve the problem caused by the weight of the engine upon these primitive rails. He experimented with a 'steam spring' (to 'cushion' the weight using steam pressure), but soon followed the new practice of 'distributing' weight with the addition of several wheels. The Blucher established Stephenson's reputation, and in 1819 he was given the task of building a 8-mile (13-km) railroad from Hetton colliery to Sunderland. During this project, Stephenson concluded that to be successful, steam railways had to be made as level as possible by civil engineering works. The track was laid out in sections. The first part was worked by locomotives, this was followed by fixed engines and cables. After the railway reached 250 feet above sea level, the coal wagons traveled down over 2 miles of self-acting inclined plane. This was followed by another 2 miles of locomotive haulage. George Stephenson only used fixed engines and locomotives and had therefore produced the first ever railway that was completely independent of animal power. In 1821, a parliamentary bill was passed authorizing a company owned by Edward Pease to build a horse railway. The 25-mile (40 km) Stockton and Darlington Railway was intended to connect various collieries situated near Bishop Auckland to the River Tees at Stockton, passing through Darlington on the way. George Stephenson arranged a meeting with Pease and suggested that he should consider building a locomotive railway, telling Pease that the Blutcher locomotive that he had built at Killingworth was "worth fifty horses." Once Pease saw the Blutcher at work he realized Stephenson was right and offered him the post of chief engineer of the Stockton & Darlington company. Pease applied for a further Act of Parliament, adding a clause stating that Parliament gave permission for the company "to make and erect locomotive or moveable engines." Stephenson surveyed the line in 1821, assisted by his 18-year-old son Robert. A manufacturer was now needed to provide the locomotives for the new line. As it turned out, Pease and Stephenson jointly established a company in Newcastle to manufacture locomotives. The company was set up as Robert Stephenson and Company, and George’s son Robert was the managing director. A fourth partner was Michael Longridge of Bedlington Ironworks. In 1821 John Birkinshaw, an engineer at Bedlington Ironworks, developed a new method of rolling wrought iron rails in 15 feet lengths that were much less liable to crack under the weight of heavy locomotives. Stephenson went to see these malleable rails and decided they were better than those that he was making with Losh. Although it cost him a considerable amount of money, Stephenson decided to use Birkinshaw's rails, rather than those he made with Losh, on the Stockton & Darlington line. William Losh of Walker Ironworks had thought that he had an agreement with Stephenson to use his cast-iron rails, and Stephenson's decision caused a permanent rift between the two men. Work on the track began in 1822. George Stephenson used malleable iron rails carried on cast iron chairs. These rails were laid on wooden blocks for 12 miles between Stockton and Darlington. The 15-mile track from the collieries and Darlington were laid on stone blocks. In September 1825 the works at Newcastle completed the first locomotive for the new railway: originally named Active, it was soon renamed Locomotion. It was followed by “Hope,” “Diligence” and “Black Diamond.” The Stockton and Darlington Railway opened on September 27, 1825, marking the launch of modern railways. Driven by Stephenson, Locomotion hauled an 80-ton load of coal and flour nine miles (15 km) in two hours, reaching a speed of 24 miles per hour (39 km/h) on one stretch. The first purpose-built passenger car, dubbed Experiment, was attached, and carried dignitaries on the opening journey. It was the first time passenger traffic had been run on a steam locomotive railway. The Stockton & Darlington line reduced the cost of transporting coal from 18s. to 8s. 6d. a ton and it soon became clear that large profits could be made by building railways. A group of businessmen led by James Sandars recruited George Stephenson to build them a railway to reduce the costs of transporting raw materials and finished goods between Manchester, the center of the textile industry and Liverpool, the most important port in the north of England. The proposed Liverpool & Manchester Railway was a serious economic threat to the Bridgewater Canal, which was making a fortune by shipping goods between Liverpool and Manchester. The principal owner of the canal led the fight against the planned railway, joined by Turnpike Trusts, coach companies and farmers. Some affected landowners on the rail route were so opposed they used physical violence to turn the surveyors off their property, requiring parts of the route to be mapped at night. The resulting defective measurements meant that Stephenson encountered difficulty during Parliamentary scrutiny of the original bill, specifying the route for purchase of land. The Bill was rejected and an act was not obtained until 1825. The revised alignment presented a considerable problem: the crossing of Chat Moss, an apparently bottomless peat bog, which Stephenson eventually overcame by using fascines - bundles of wood - to support the rails, effectively floating the line across it. Doubters said the plan would never work - but the wooden bundles are still there and still doing their job today. While building the Stockton and Darlington Railway, Stephenson had noticed that on a smooth, level track, a tractive force of ten pounds would move a ton of weight. However, when there was a gradient of 1 in 200, the hauling power of a locomotive was reduced by 50 percent (and slight declines would have made the primitive brakes nearly useless). He came to the conclusion that railways specially designed to be kept as level as possible. This meant that considerable time had to be spent on cuttings, tunnels and embankments. He used this knowledge while working on the Bolton and Leigh Railway, and the Liverpool and Manchester Railway (L&MR), executing a series of difficult cuts, embankments and stone viaducts to smooth the route the railways took. As the L&MR approached completion in 1829, its directors arranged for a competition to decide who would build its locomotives, and the Rainhill Trials were run in October 1829. Entries could weigh no more than six tons and had to travel along the track for a total distance of 60 miles (97 km). Stephenson's entry was Rocket, and its performance in winning the contest made it famous. George’s son Robert had been working in South America from 1824 to 1827 and had returned to run the Newscastle rail works while George was living in Liverpool and overseeing the construction of the new line. Robert was very much responsible for the detailed design of Rocket, although he was in constant postal communication with George, who made many suggestions on the design. One significant innovation was the use of a fire-tube boiler, invented by French engineer Marc Seguin that gave improved heat exchange. This was suggested by Henry Booth, the treasurer of the L&MR. The opening ceremony of the L&MR, on September 15, 1830, was a considerable event, drawing luminaries from the government and industry, including the Prime Minister, the Duke of Wellington. The day started with a procession of eight trains setting out from Liverpool. The parade was led by “Northumbrian” driven by George Stephenson, and included “Phoenix” driven by his son Robert, “North Star” driven by his brother Robert and “Rocket” driven by assistant engineer Joseph Locke. The day was marred by the death of William Huskisson, the Member of Parliament for Liverpool, who was struck and killed by Rocket, but the railway was a resounding success. Stephenson became famous, and was offered the position of chief engineer for a wide variety of other railways. 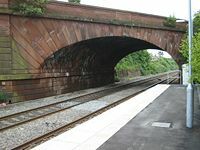 George Stephenson also built the well-known Skew Bridge, which was opened in 1830 and carries the Warrington Road (A57) across the railway line near the station in Rainhill. The bridge was the first to cross a railway at an angle. 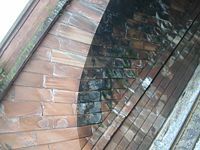 This required the structure to be constructed as two flat planes (overlapping in this case by 6 feet) between which the stonework forms a parallelogram shape when viewed from above. This has the effect of flattening the arch and the solution is to lay the bricks forming the arch at an angle to the abutments (the piers on which the arches rest). This technique, which results in a spiral effect in the arch masonry, provides extra strength in the arch to compensate for the angled abutments. The bridge still carries traffic (A57 - Warrington Road) and is now a listed building. The next ten years were the busiest of Stephenson’s life, as he was besieged with requests from railway promoters. Other talented men were starting to make their marks, such as his son Robert, his pupil Joseph Locke and finally Isambard Kingdom Brunel. His conservative views on the capabilities of locomotives meant that he favored circuitous routes and civil engineering that were more costly than his successors thought necessary. For example, rather than the West Coast Main Line taking the direct route favored by Joseph Locke over Shap between Lancaster and Carlisle, Stephenson was in favor of a longer sea-level route via Ulverston and Whitehaven. Locke's route was the one built. Stephenson also tended to be more casual in estimating costs and paperwork in general. He worked with Joseph Locke on the Grand Junction Railway with one half of the line allocated to each man. Stephenson’s estimates proved to be inferior to those of Locke and the board’s impatience led to Stephenson’s resignation. This caused a rift between Stephenson and Locke, which was never healed. Despite Stephenson's losing some routes to competitors due to his caution, he was offered more work than he could cope with. He worked on the North Midlands line from Derby to Leeds, the North Midlands line from Normanton to York, the Manchester and Leeds, the Birmingham and Derby, the Sheffield and Rotherham among many others. Stephenson tended to become a reassuring name, rather than a cutting-edge technical adviser. He was the first president of the Institution of Mechanical Engineers on its formation in 1847. He had by this time settled into semi-retirement, supervising his mining interests in Derbyshire—tunneling work for the North Midland Railway had revealed unworked coal seams, and Stephenson put much of his money into their exploitation. Stephenson’s first wife, Fanny died in 1806, and his only son, Robert was brought up by George and his unmarried sister Eleanor. In 1820, George married Elizabeth Hindmarsh, a farmer’s daughter whom George had wanted to marry when he was young; he had been considered unworthy of her. George and Elizabeth (Betty) had no children, and she died in 1845. In 1848 George married for the third time, to Ellen Gregory who had been his housekeeper. Six months after his wedding, George contracted pleurisy and died, aged 67, on August 12, 1848 at Tapton House in Chesterfield, Derbyshire. He was buried at Holy Trinity Church, Chesterfield, alongside his second wife. George Stephenson had two children: Robert and Fanny. Robert was born in 1803 and married Frances Sanderson in 1829. Robert died in 1859 having no children. Fanny was born in 1805 but died within weeks of her birth. Richard Trevithick invented the locomotive and deserves that credit. But George Stephenson's early and unwavering advocacy of rail transport, insightful innovations, and founding commercial success with the Stockton and Darlington Railway and the Liverpool and Manchester Railway, has earned him the title, "Father of Railways." Stephenson paved the way for the railway engineers who were to follow, such as his son Robert, his assistant Joseph Locke who went on to carry out much work on his own account and Isambard Kingdom Brunel. Due to the pioneering work of Trevithick, Stephenson and their many contemporaries, Britain led the world in the development of railways and this acted as a stimulus for the industrial revolution, by facilitating the transport of raw materials and manufactured goods. Stephenson was also farsighted in realizing that the individual rail lines being built would eventually join together, and would need to have the same gauge. The standard gauge used throughout much of the world is due to him. 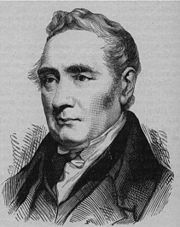 In 2002, George Stephenson made the BBC list of the top 100 greatest Britons. The museum in Chesterfield, Derbyshire has a room full of Stephenson memorabilia, including the straight thick glass tubes in which he invented to grow his cucumbers to stop them curving. George Stephenson College, founded in 2001 on the University of Durham's Queen's Campus in Stockton-on-Tees, is named after him, with the student union bar being named The Rocket. Also named after him and his son is George Stephenson High School in Killingworth, the Stephenson Railway Museum in North Shields and the Stephenson Locomotive Society. As a tribute to his life and works, a bronze statue of Stephenson was unveiled at Chesterfield railway station (which is overlooked by Tapton House, where Stephenson spent the last ten years of his life) on October 28, 2005, marking the completion of improvements to the station. At the event a full-size working replica of the Rocket was on show, which then spent two days on public display at the Chesterfield Market Festival. Stephenson's portrait appeared on Bank of England £5 notes between 1990 and 2003. ↑ 1.00 1.01 1.02 1.03 1.04 1.05 1.06 1.07 1.08 1.09 1.10 Davies, Hunter. 1975. George Stephenson: A Biographical Study of the Father of Railways. London: Weidenfeld and Nicolson. ISBN 0297769340. ↑ Rolt, L.T.C. 2009. George and Robert Stephenson: The Railway Revolution. Stroud: Amberley. ISBN 9781848681644. ↑ 3.0 3.1 George Stephenson. Spartacus Educational. Retrieved March 2, 2009. ↑ Liverpool and Manchester. Spartacus Educational. Retrieved February 25, 2009. ↑ George Stephenson. Cotton Times. Retrieved February 25, 2009. ↑ Railway History. Rainhill Parish Council. Retrieved March 2, 2009. ↑ Simmons, Jack, and Gordon Biddle. 1997. The Oxford Companion to British Railway History: From 1603 to the 1990s, pp. 45-47. Oxford: Oxford University Press. ISBN 0192116975. ↑ Great Britons - The Great Debate. Internet Forum. Retrieved February 25, 2009. George Stephenson: Inventor of the Steam Locomotive Engine . This page was last modified on 16 June 2017, at 16:52.